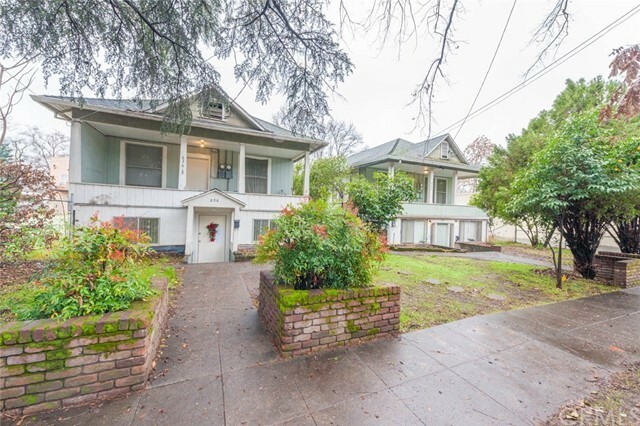 Prime downtown Chico income property with four - (4)bedroom units consisting of 2 duplexes and a vacant corner lot with development opportunity. This listing is comprised of 2 parcels being sold together. 828 and 828 1/2 Wall St. is a duplex on one parcel, and 836 and 836 1/2 Wall St. plus the vacant corner lot are on the second and larger parcel. The addresses for the vacant lot will be on 9th St. and per the City of Chico are zoned C1, commercial mixed use including retail, residential, commercial and office. The 2 residential duplexes are very similar and have a strong rental history. Each unit consists of 4 bedrooms and 1 bath large living room and kitchen, with laundry in 3 of the units, and high ceilings and porches in the upstairs units. Inclusions: Refrigerators in 828, 8281/2, 836 1/2. Washer/dryers in 836 1/2, 828.